First, I want to apologize for being a bit behind in updating the blog. There have been so many things going on with the book, as well as with Steve and my work, that they have been keeping us very busy. As many of our readers know, Steve and I undertook 2018 with a passion to get The Silver Horn Echoes in front of audiences. This has been a tremendous amount of work, and I find that our most effective method to reach readers is to interact with them at author events. We began this journey a year ago with live events here in Northern Virginia, followed by additional events in late 2017 in Northeast Ohio. Then we launched into 2018 with book reviews, live web interviews, and followed by pop culture and comic conventions, beginning with Awesome Con in Washington, D.C. We took opportunities, both large and small, to introduce the book and story to readers who often had never heard of Roland, Charlemagne, Aude or the tale of Roncevaux. As a result, we have made friends, sold books, and introduced hundreds of potential new readers to a Dark Ages world of intrigue and danger. Along with live events, The Silver Horn Echoes has won awards that we publicize on social media, as well as on our website. We will be working to pull this recognition together on one page for you to find it all with a simple click. But that is a future update! This update, well, it is intended to announce another award for the novel. Drum roll please… New Apple just announced the winners of their 2018 Summer E-Book Awards. This contest literally draws hundreds and hundreds of entries and is one of the most respected contests and awards for independent new content. 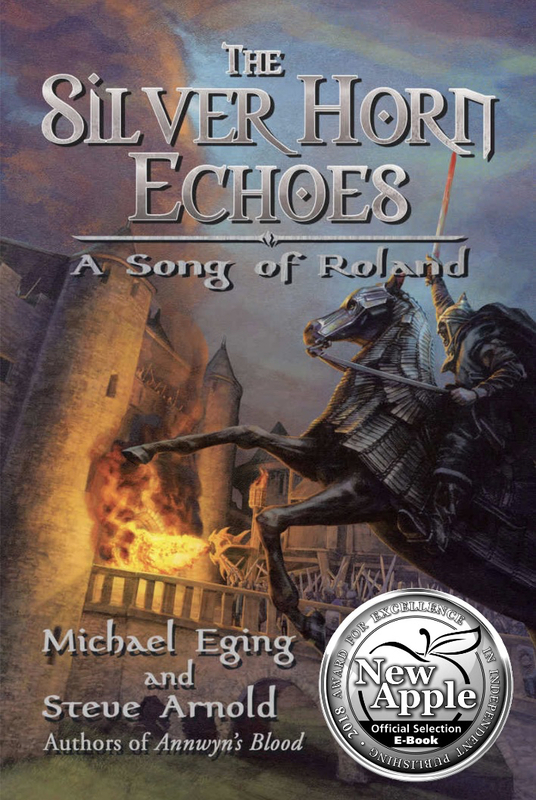 We are ecstatic about the recognition of the novel, and thank the judges at New Apple for taking the time to read and recognize the tale of Roland and his companions. Stay tuned for more information as the organization begins publicizing the announcements. On December 2, 2018, we wrap up our life on the road supporting the book in 2018. This doesn’t mean that we won’t be busy in 2019! But both Steve and I need a breather to spend time with friends and family for the holidays. Also, we have another novel coming in 2019 that we are very excited to get into your hands, the long awaited sequel to Annwyn’s Blood, Book One of The Paladin of Shadow Chronicles. A few months ago, we published a brief excerpt of the book in our blog! Stay tuned, as we are currently working with the artist (yes, the same artist who crafted the cover for The Silver Horn Echoes) to design a new cover for Annwyn’s Blood and Sword of the Magnus. Also, we have been working with a number of artists to bring to life Roland, as well as other tales that we’ve been crafting, so keep an eye on this blog for future announcements! I’m going to wrap this blog post up. So, before I go, I’ve added the most recent book promo video that we’ve produced. We hope you enjoy it!